In this Pocket PC anthology we have brought together the software titles for the West European languages found in our catalogue. Together, these applications are the perfect means to communicate with virtually anyone in or from Western Europe in a most straightforward and productive fashion. LingvoSoft Pocket PC applications featuring the Spanish language are assembled in the LingvoSoft Spanish Software Pack. 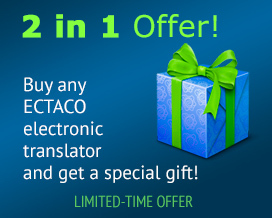 This versatile collection answers the needs of many kinds of users: businesspeople dealing with Spanish native speakers, frequent travelers to Spanish-speaking countries, and foreign language students. LingvoSoft Pocket PC applications featuring the French language are assembled in the LingvoSoft French Software Pack. This versatile collection answers the needs of many kinds of users: businesspeople dealing with French native speakers, frequent travelers to francophone countries, and foreign language students. LingvoSoft Pocket PC applications featuring the German language are assembled in the LingvoSoft German Software Pack. This versatile collection answers the needs of many kinds of users: businesspeople dealing with German native speakers, frequent travelers to German-speaking countries, and foreign language students. LingvoSoft Pocket PC applications featuring the Russian language are assembled in the LingvoSoft Russian Software Pack. This versatile collection answers the needs of many kinds of users: businesspeople dealing with Russian native speakers, frequent travelers to Russian-speaking countries, and foreign language students. 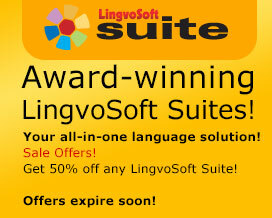 LingvoSoft Pocket PC applications featuring the Polish language are assembled in the LingvoSoft Polish Software Pack. This versatile collection answers the needs of many kinds of users: businesspeople dealing with Polish native speakers, frequent travelers to Poland, and foreign language students. LingvoSoft Pocket PC applications featuring the Portuguese language are assembled in the LingvoSoft Portuguese Software Pack. This versatile collection answers the needs of many kinds of users: businesspeople dealing with Portuguese native speakers, frequent travelers to francophone countries, and foreign language students. LingvoSoft Pocket PC applications featuring the Turkish language are assembled in the LingvoSoft Turkish Software Pack. This versatile collection answers the needs of many kinds of users: businesspeople dealing with Turkish native speakers, frequent travelers to francophone countries, and foreign language students. LingvoSoft Pocket PC applications featuring the Arabic language are assembled in the LingvoSoft Arabic Software Pack. This versatile collection answers the needs of many kinds of users: businesspeople dealing with Arabic native speakers, frequent travelers to the Middle East, and foreign language students. In this Pocket PC suite we have gathered the most in-demand software for traveling to Asia. Together, these applications will make your Oriental trip more trouble-free, more productive, and thus more enjoyable!